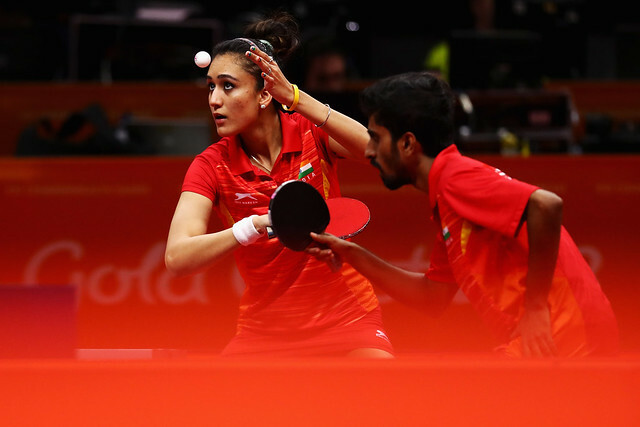 The final, four years ago in Glasgow, Singapore beat England to claim gold; at the Gold Coast 2018 Commonwealth Games the contest was the bronze medal match and it was a reversal of fortunes. There was an air of anti-climax after the tension of the morning when both Singapore and England had lost in contests that had gone the full five match distance; they were playing for the second prize not as four years ago the top prize. Throughout the tournament for Singapore, Gao Ning had been the key figure, he was the player who in the morning session of play had won both his matches against India. Allied with younger players in the guise of Ethan Poh Shao Feng and Pang Xue Jie, the view was that for Singapore to secure the bronze medal, two wins from Gao Ning were mandatory. In the opening contest of the fixture he was beaten in straight games by Paul Drinkhall (13-11, 11-5, 11-9). Most certainly it was a splendid performance by Paul Drinkhall, who was back on court just over an hour after the conclusion of the semi-final contest; it was a display which set an example for his colleagues and set the tone for the fixture. England leading by two matches to nil, Paul Drinkhall joined forces with David McBeath; it was a change to English policy. Previously the combination had been Paul Drinkhall in harness with Sam Walker; for Singapore there was no change, Ethan Poh Sao Feng joined forces with Pang Xue Jie. The English pair took time to settle, they lost the first two games, recovered to win the next two games but in the decisive fifth game it looked as though the fightback would be thwarted. They trailed 6-10 before winning the next five points! Ethan Poh Sao Feng and Pang Xue Jie saved the match point but when a second opportunity for the English pair arose they could not repeat the feat, victory by the very narrowest of margins had been secured (6-11, 11-13, 11-4, 11-9, 13-11). Success and smiles, a muted celebration, to some extent it was the consolation prize but it was prize, for Singapore, after the Women’s Team had suffered in the final one day earlier it was another day of disappointment.